Rural France is characterised in Summer by the seemingly constant round of Fêtes, Foires and a wide range of special markets and festivals of all kinds (one local one coming up is a celebration of Melons and Garlic!) Every Commune, no matter how small, seems to host its own event and not a one of them is complete without some kind of Repas. Our Maison Celle event on Tuesday was a very special and a-typical one, having been created specifically for bringing the English and French in our village together. Maison Celle is however part of a Commune. The village used to be under the auspices of Saint-Rémy, which has now merged to form the larger Commune of Lathus-Saint-Rémy. Although the entire Commune shares a Mairie and services, they have not yet merged to the extent that they share their Fête! The Lathus event has been and gone but the Saint-Rémy one happens this Saturday. We are planning to attend. Saint-Rémy is not a large village by any means but it does have a part-time Mairie, a Church, a Salle des Fêtes and a Stade of its own. 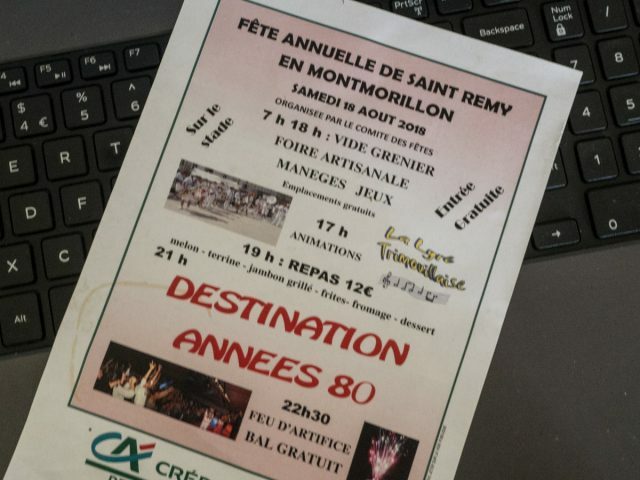 The Fête on Saturday will be held at the Stade, which is on the edge of Saint-Rémy that is very happily closest to us, so our walk will not be a long one. It is a long day. A Vide Grenier and Artisanal Market begin at 07:00 and run until 18:00. Vide Grenier is a term that we came across very early in our French travels. My trusty Collins French/English Dictionary revealed the literal translation to be empty attic. It took a little while but I finally got there… it’s a Car Boot Sale! With a 7am start, I fear that all the best bargains will be long gone before we walk down there. During the day there will be a brass band, rides and games including, apparently, Ring a Duck with live ducks – you ring it, you take it home – and rifle shooting, for the little ones (the emphasis is mine). Fast food will be available; Frites, of course, and Angie from the Laiterie Lathus will be in attendance selling her ice cream. Later in the day there will be entertainments before the Repas (there is always a Repas…), which is a five course affair (€12) at 19:00 with melon, terrine, jambon grillé, fromage et dessert. Apparently we may also expect a very dangerous local alcoholic speciality to drink, made from red wine and bread. Served in a bowl, icy cold, we have been warned to take it easy… This is a matter that I shall report back on. Post-dinner musical entertainment has an 80s flavour at 21:00 hrs. Throughout France, communities are given money for fireworks for Bastille Day celebrations. The smaller communities cannot compete with the festivities in larger towns and most people seem to go to the larger events. So, the smaller Communes keep their firework money and spend it on their Fête Annuelle or some similar event. Saint-Rémy does just this. The Feu d’Artifice are on at 22:30. There then follows a dance, at 23:00. Actually, if I read correctly, there are two dances, one of which is to be outdoors and the other inside. Yes, a long day indeed. We won’t be in attendance for the whole thing, due to the needs of various cats and a dog but will stroll down to look at the available Brocante then walk home again and return in the evening for the dinner. I have made enquiries about how one copes with staggering home after the event. The answer that I received is not a very proper one and I do not intend to share it here but one way or another, we shall cope. It’s only about a mile… or 1.6 km, to be precise. There will be more to blog on the topic of French country entertainments combined with food. I can promise a real treat forthcoming. Sounds heaven for the repas alone…. (12 Euros!!!!) – then the Vide…the brocantes…yes, indeed, you will be expected and required to report back on ALL of this! !